The 1980s saw the privatisation of British Aerospace and of Rolls-Royce. It was a decade of major political change behind the Iron Curtain with the Velvet Revolution in Czechoslovakia, the overthrow of the Ceauşescu regime in Romania and the breaking down of the Berlin Wall. It was also the decade of yuppies, shoulder-pads and Live Aid. Space Shuttle Columbia launched for its first mission. 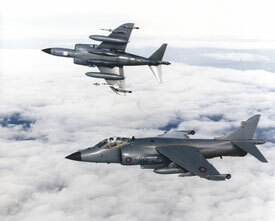 Sea Harriers shoot down 21 Argentine jets without combat loss during Falklands War. Laker Airways calls in the receivers. First Airbus A310 completed. First launch of space shuttle Atlantis. First Filton-built wings for the Airbus consortium's A320 despatched. Westland Lynx with two Rolls-Royce Gem60 engines sets World's Helicopter Speed record at 400.87kph which still stands (Gems built at Bristol since 1992). Space shuttle Challenger explodes 75 seconds after take off. British Airports Authority is privatised. End of guided missile production at Filton. Harrier with Pegasus 11-61 engine sets time-to-height records at 3,000m (36.38 seconds), 6,000m (55.38 seconds) and 9,000m (81 seconds). Space shuttle Atlantis launches Jupiter probe. 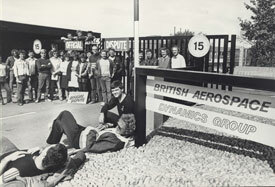 Pickets at British Aerospace Dynamic gates, 1984. 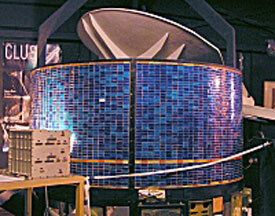 See the Giotto Space Vehicle mock-up at the Bristol Aero Collection at Kemble. Search the Aviation Archive for images of West of England aircraft in the 1980s.